Before you catch that flight, here are 52 super cool things to do in Los Angeles that won’t break the bank. Is there anything more iconic in Los Angeles than the Hollywood sign? What was once an outdoor ad campaign for a housing development called Hollywoodland has turned into an iconic symbol of the city. While the Hollywood sign’s grounds are barred from public access there are some nearby hikes that allow for great photos. 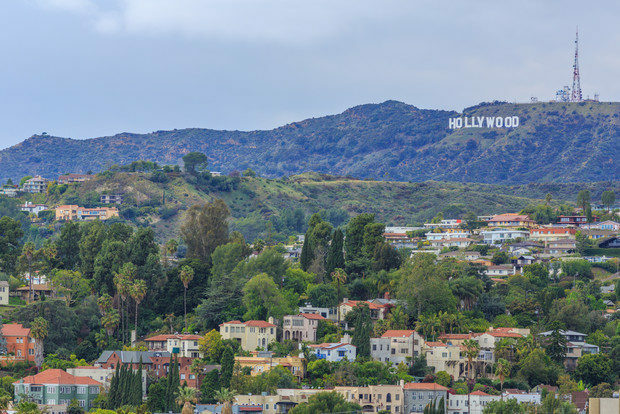 One of the world’s most famous scenic drives, Mulholland Drive, winds from the Hollywood Hills across the spine of the Santa Monica Mountains and west towards the Pacific Ocean. There are several overlooks from which to take in the picture-perfect views of the city. Satisfy your sweet tooth at Sweet Rose Creamery. With at least 12 homemade ice cream flavours on offer daily, as well as fruit pops, sundaes, milkshakes, cakes and pies, you may find yourself coming back for seconds and thirds. Check out the latest art at the Downtown LA Art Walk, which occurs the second Thursday of the month. Art lovers can stroll the neighbourhood’s galleries and enjoy special programming and activities along Spring and Main Streets during the free, self-guided public art event. The TCL Chinese Theatre is an iconic structure easily identifiable by its architecture that includes two coral red columns topped with an iron mask, bronze roof, a 30-foot stone dragon and two heaven dogs brought from China that guard the entrance. The forecourt has been one of the most popular free attractions since the 1920s, when actress Norma Talmadge accidentally stepped in wet cement during a film premiere. Now, travellers from around the world compare their hands and feet to those of stars past and present. A motley crew awaits people-watchers at Venice Beach’s Ocean Front Walk. 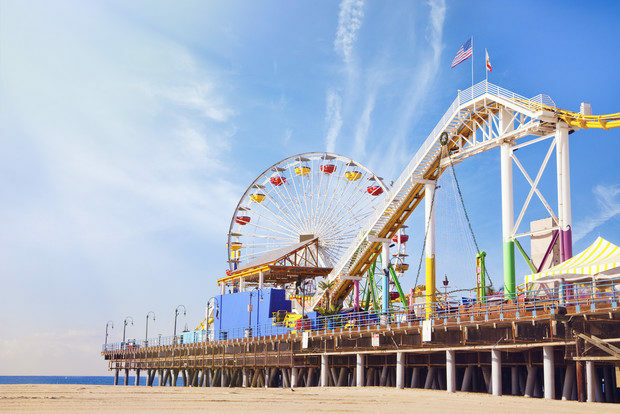 The east side of the boardwalk is lined with souvenir shops and restaurants while the west side features street performers of every type: tarot card readers, chainsaw jugglers, roller skaters and more – all hoping for a tip, of course. Since 1922, this iconic outdoor venue has been offering up live music under the stars. Depending on the event you choose, tickets can be found for less than US$20 (around £16). A little over 60 kilometres from downtown LA in the Santa Monica Mountains you’ll find Paramount Ranch, which is home to “Western Town,” a set used in a number of films and television shows from classic Westerns to more recent TV hits. This surprisingly hidden gem is a must for film buffs and is free to explore. This Hollywood legend began when husband-and-wife Paul and Betty Pink opened a hot dog cart to sell chilli dogs on the corner of La Brea and Melrose in 1939. Some 75 years later, the hot dog stand, Pink’s Hot Dogs, is run by the same family and has a celebrity following who crave the 30 types of hot dogs on the menu. Founded in 1899 and the final resting place for icons like Johnny Ramone, Cecil B. DeMille and Jayne Mansfield, Hollywood Forever is one of the oldest graveyards in Los Angeles and located right on Santa Monica Boulevard. Hollywood Forever also hosts a variety of events, including their popular outdoor movie nights. The Natural History Museum of Los Angeles County boasts more than 35 million specimens covering 4.5 billion years of history including a massive dinosaur hall. Admission is free during the first Tuesday of each month (except for in July and August). The California Science Center offers free general admission to its permanent exhibit galleries seven days a week. The expansive facility houses four major exhibit areas including World of Life, Creative World, Ecosystems and Space Shuttle Endeavour. In addition, the California Science Center hosts international touring exhibits and has a 7-story IMAX theatre. For history and cultural exhibits, look no further than the California African American Museum, which houses three exhibition galleries, a theatre gallery, a glass-ceiling courtyard, a research library and more. Admission is free. Since 1928, the Exposition Park rose garden has been open to the public as a place of quiet and refuge. You can visit 9am to sunset, but keep in mind that the garden closes each year from 1st January – 15th March for annual maintenance. 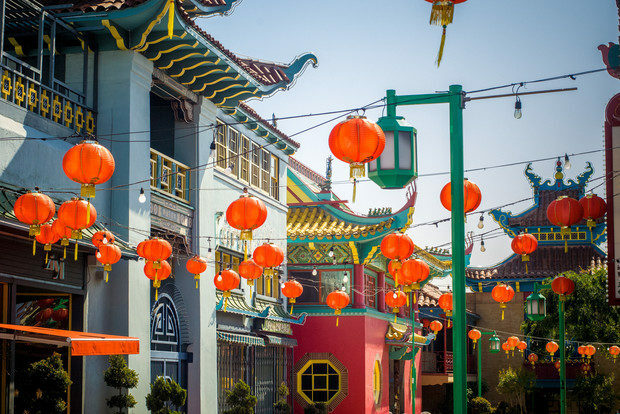 Dating back to 1938, the first established Chinatown in America is brimming with cultural history woven into a bustling community. Wander the Central Plaza, explore the art galleries of Chung King Road, or take a walking tour. Colourful murals adorn many building and neighbourhoods in Los Angeles. These city treasures tell stories of the city’s cultural past, present and future of the hopes and dreams of the city. Visitors can find many of the city’s murals in metro stations, the LA Arts District in downtown and at the Mural Conservancy of Los Angeles. Learn about LA’s birthplace at the site of its original settlement in 1781 at El Pueblo de Los Angeles. The spot includes an outdoor plaza, historic buildings and a traditional Mexican marketplace on Olvera Street. Shop, listen to mariachi music and dine at authentic Mexican restaurants on Olvera Street. Tour the Avila Adobe, the oldest existing house in LA, and visit other restored historic buildings including the Old Plaza Church and the Old Plaza Firehouse. Dating to the 1880s, Little Tokyo is the cultural and historical centre for Japanese Americans in Los Angeles. The neighbourhood is comprised of multi-generational family-run restaurants, shops, temples and historical structures. The Los Angeles Memorial Coliseum and Sports Arena is home of the 1932 and 1984 Summer Olympics and the University of Southern California Trojans football team and hosts numerous events throughout the year. Since the 1960s, more than 2,482 terrazzo and brass stars have been unveiled on Hollywood’s major sidewalks as part of the Hollywood Walk of Fame. Administered by the Hollywood Chamber of Commerce, the public sidewalk that stretches along Hollywood Boulevard and Vine Street is a tribute to all who have worked to develop the city as a tourist attraction. The best way to see your favourite celebrities up close and personal is to check out the Hollywood Walk of Fame star-dedication ceremonies. One to 2 stars are added each month and their installations are free and open to the public. 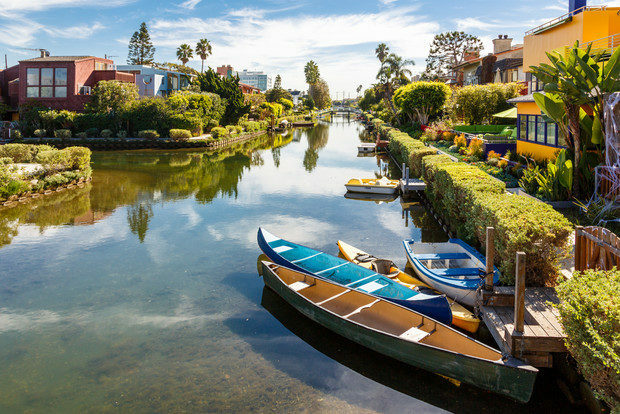 Winding through quaint (and very expensive) houses, the canals feature arched bridges and beautiful landscaping created by Abbot Kinney nearly 100 years ago as the “Venice of America.” Start between Washington Avenue and Venice Boulevard and walk or bike the three-kilometre path. The journey takes about an hour to navigate. The nearly five-kilometre expanse of Venice Beach is world famous for its golden sands, glistening waves and Ocean Front Walk, but you can’t leave here without checking out Muscle Beach, home to amateur and professional bodybuilders alike. Overlooking the California coastline and the LA skyline, The Getty Center surrounds guests with breathtaking views and a world-class art collection, including European paintings, sculptures, contemporary photographs and decorative arts. Best of all, entry to the museum is free. The magnificent Malibu property, The Getty Villa, includes an educational centre and museum dedicated to antiquities including art from the ancient Greek and Roman world. Entry to The Getty Villa is free. Visit the Angelino Heights neighbourhood (specifically, the 1300 block of Carroll Avenue) for a look back at the lasting influence the Victorian era had on the area’s architecture. You may even recognize a few of the restored Victorian houses from film and television, including the Halliwell family home from “Charmed”. Take a guided tour for US$15 (around £12), or wander the neighbourhood’s quaint streets on your own for free. Considered LA’s best deli since 1931, Canter’s is a family-owned Jewish deli that started as a small storefront and has now expanded to a bakery, deli and cocktail lounge. For a free 360-degree panorama of downtown Los Angeles, head to the observation deck on the 27th floor of City Hall. There’s no charge to check out the view. Located in Griffith Park, the Travel Town Museum is dedicated to the preservation and celebration of railroading in the western United States, featuring displays of historic steam locomotives, passenger cars and trolleys. Admission is always free. The Fashion Institute of Design & Merchandising has a treasured collection of more than 15,000 costumes, accessories and textiles from the 19th century through the present day, including gorgeous film and theatre costumes – a fashionista’s dream day. One of Los Angeles’ most iconic foods is the French Dip sandwich, a hearty sandwich piled high with oven-roasted beef, pork, turkey or lamb served with or without cheese on a French roll and dipped in au jus (the juice of the roast). There are two restaurants who claim to have invented the messy sandwich: Philippe The Original, which sells on average 3,000 sandwiches daily, and Cole’s. Take a taste test at both. John and Pat Wolfe opened a hot dog and hamburger stand inside an old Pacific Railroad passenger train car on the Sunset Strip in 1975 and the rest is history. Some 40 years later, celebrities and locals continue to rave about Carney’s hamburgers and hot dogs. Take a ride on The Grove Trolley, a free trolley that travels along First Street between The Grove shopping centre and The Original Farmers Market. The trolley is built on top the undercarriage of a 1950 Boston streetcar and powered electrically, the first in the U.S. transit system to use inductive power. Fred Beck and Roger Dahlhjelm wanted to build a spot where local farmers could sell their fresh produce. So, in July 1934, a dozen farmers began selling their wares from the backs of their trucks. The idea stuck and The Original Farmers Market has continued to flourish and expand at the corner of West 3rd and Fairfax. Housed in the last Victorian residence in Hollywood, No Vacancy at Hotel Juniper is a three-level bar that evokes 1930s nostalgia, replete with a vintage hotel lobby, antique bar on the patio, secluded outdoor garden, a secret entrance and a rotating list of 12 cocktails called The Dirty Dozen. A downtown Los Angeles landmark since 1917, Grand Central Market offers up all types of food to delight your taste buds. From classic American fare to pizza and BBQ, there’s plenty of choice. Food is reasonably priced, and there’s no cost to wander the market, which also hosts free events including music and game nights. Located in the trendy Los Angeles Arts District, tour Angel City Brewery and taste locally-crafted beer. The brewery also hosts events from art to music to yoga. 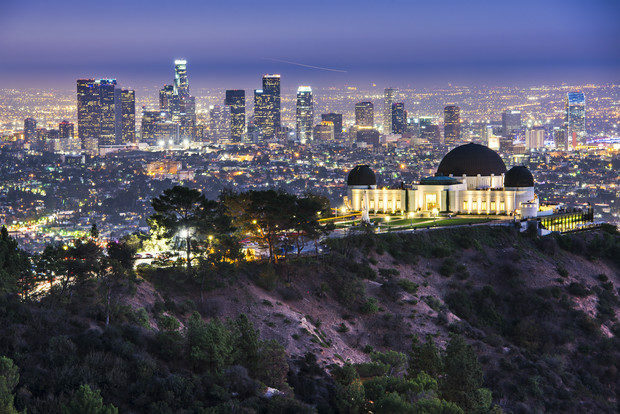 To learn about stars that are truly out of this world, visit the Griffith Observatory. The exhibitions and displays in this renovated Griffith Park landmark are all free, as is an introductory video about the building and its contents. Note, however, that there’s a fee for admission to the Samuel Oschin Planetarium. The Museum of Contemporary Art hosts a fine collection of 6,800 pieces of American and European art created since 1940. It’s the only museum in LA dedicated to contemporary art. Admission is free from 5-8pm on the first Thursday of each month. The hop-on, hop-off Starline Double Decker Bus tours are an efficient way to explore Los Angeles. For the price of one ticket, you can go at your own pace, hopping on and off at 70 stops in Hollywood, West Hollywood, Beverly Hills, Santa Monica, Venice, Marina Del Ray and downtown Los Angeles for up to 24 hours. While the ticket will set you back US$49 (around £38), it will provide significant savings for a day of sightseeing. In the heart of Beverly Hills, you’ll find Rodeo Drive, which is home to three blocks of luxury shopping, The Beverly Hills Hotel and the Beverly Wilshire, a Four Seasons Hotel. While prices there are far from cheap, there’s no cost for window shopping or people watching on this iconic street. If window shopping brought on some serious style envy, not to worry. Check out the sales racks at Abbot Kinney Boulevard, a cluster of home-grown artist shops, vintage clothiers and jewellery stores. Pacific Coast Highway, or PCH as the locals call it, is a sun-drenched road that hugs the coastline. On one side are golden beaches populated with surfers and sun worshippers and on the other side are magnificent multi-million dollar homes. Off the PCH, stop and enjoy incredible sunsets and panoramic views of the Pacific Ocean from Gladstone’s Malibu, a beachfront restaurant famous for its seafood and cocktails. Founded by businessman Henry E. Huntington, The Huntington, a research and education centre, contains a library of rare books and manuscripts, art galleries with 18th and 19th century British and French art, and botanical gardens. It’s also a fantastic place to enjoy high tea. 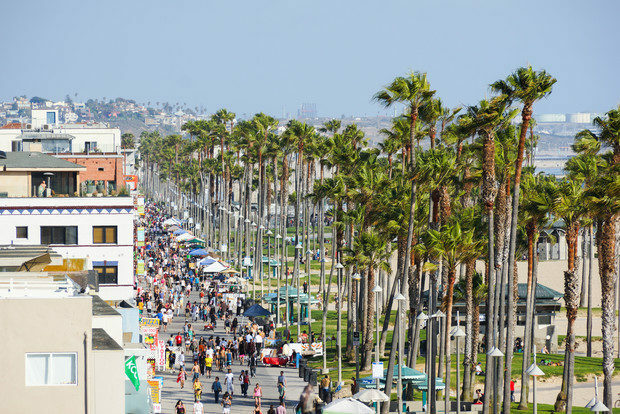 Nestled along the gently sloping Montana Street are 10 blocks of boutique shops, restaurants and coffee shops that culminate at the Santa Monica coast. A short two blocks from Hollywood Boulevard, this city park offers up views of the Pacific Ocean and the Hollywood Sign. Get moving on one of the park’s hiking trails, or pack a picnic lunch and enjoy the sun. Ice Age fossils right in the heart of Los Angeles? It might sound like an idea for a Hollywood blockbuster, but at the La Brea Tar Pits it’s reality. Head to the museum to check out the fossils of mammoths, sabre-toothed cats and dire wolves, and also watch as scientists work with fossils live from a glass-enclosed lab. A classic backdrop for Hollywood cinema, visit during late afternoon for the most meta of sunsets. Make a night of it, by enjoying a cocktail or two on the Sunset Strip, where you can spend the evening listening to live music at hot spots like The Roxy, The Viper Room and Whisky A Go Go. Ready to see Los Angeles for yourself? Find flights on Cheapflights.co.uk and you’ll be exploring this sunny, star-studded paradise in no time.